"Operation Crossroads" was the name of the first two of twenty-three nuclear weapons tests the United States conducted at Bikini Atoll between 1946 and 1958. Both tests involved the detonation of a weapon with a yield equivalent to twenty-three million tons of TNT–the same as the atom bomb dropped on Nagasaki. More than seven hundred cameras, and approximately five hundred camera operators surrounded the test site. Nearly half the world’s supply of film was at Bikini for the tests, making these explosions the most thoroughly photographed moment in history. 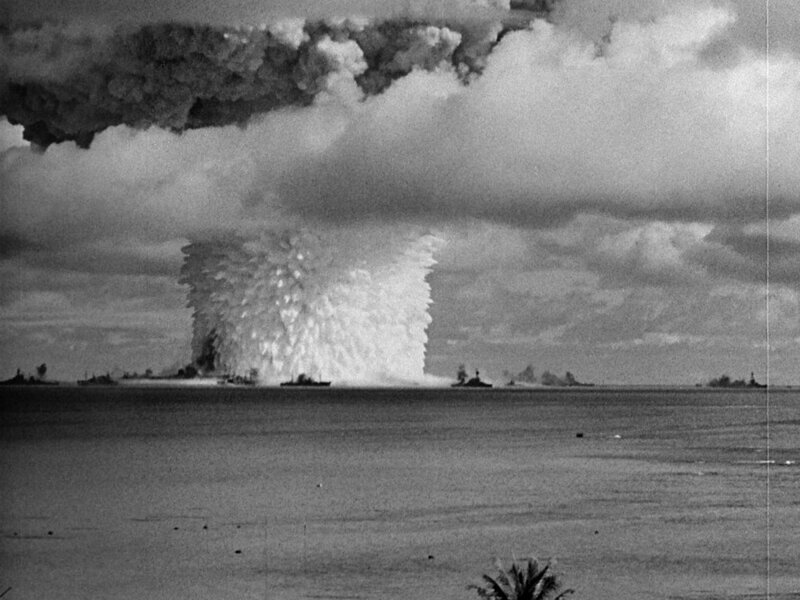 "Conner found a cataclysmic beauty in the declassified National Archives footage of the first underwater atomic bomb test “Baker Day”, which was conducted on Bikini Atoll on July 25, 1946. Twenty-three shots of the same explosion—at differing speeds and distances, from air, sea, and land—combined with a mesmerizing dual score by Patrick Gleeson and Terry Riley to make of the destruction a kind of Cubist cosmic sublime." Crossroads is big but Bombhead is small. The sentence may sound like an art koan but it’s not. It’s about two things. One is Crossroads, the name of a video that communicates the incredible destructive power of a nuclear explosion and what it means to live in a nuclear age. The second is Bombhead, the name of the exhibition at the Vancouver Art Gallery where Crossroads appears. But as an exhibition, Bombhead never really matches the impact of Crossroads. A beautiful day on the atoll. Water lapping at the beach, ships out on the water. Sea birds screeching, a light breeze mussing the palm in the foreground of a black-and-white view of the lazy Pacific. Then the bomb goes off. It is 25 July 1946. “Things happened so fast in the next five seconds that few eyewitnesses could afterwards recall the full scope and sequence of the phenomena”, wrote the physicist WA Shurcliff, in the official report of Operation Crossroads, a series of US nuclear bomb tests held less than a year after bombs were dropped on Hiroshima and Nagasaki. And then it happens again, and goes on happening, time after time in Bruce Conner’s 1976 film Crossroads, recently restored in high definition and now the sole exhibit at Thomas Dane Gallery, in London. 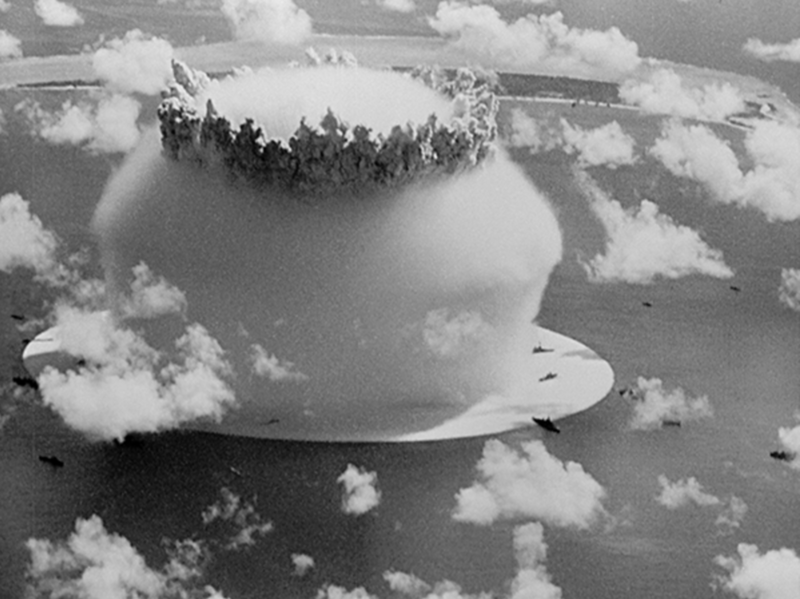 Watching the recent digital restoration of Bruce Conner’s thirty-six-minute film Crossroads, 1976, which depicts 1946 footage of the first underwater atomic bomb test at Bikini Atoll, is a vertiginous experience of telescoping back in time. Conner obtained this government-shot film from the U.S. National Archives and with minimal interventions (editing and, most notably, the addition of music), turned it into a resonant meditation on the apocalyptic sublime, rendering the familiar nuclear mushroom cloud strange again. The mushroom cloud is one of Conner’s signature images, appearing in A Movie, 1958, and briefly in Cosmic Ray, 1961, as well as in his collage works and drawings, some of which are also on display here. Bohemian artists and beatniks flocked to San Francisco in droves during the 1950s and 1960s. At the height of this wave of migration, legendary avant-garde filmmaker Bruce Conner made the city his home and began creating filmic assemblages that juxtaposed snippets of archived footage set to music.